John Shirley's knuckleball vocal delivery and images of hip, horror and humor work hand in fist with John Karr's compelling guitar-meets-techno sonic stew to create grooves that you catch like a cold. These tunes grow on you like fingernails. They're relentless, and they scratch that itch! John Shirley is clearly inspired by Iggy, but a lot of good rock artists have been. The Moderns don't play -- they brood. That is, this isn't good time music, but brooding, unsettling, thought-provoking, punk-derived rock'n'roll. Not that Red Star suffers from a lack of humor -- the album is, after all, "dedicated to the memory of FZ," and if that isn't Frank Zappa then I'm not short of cash. But tracks like "200,000 Homeless Children," "Hope There's a Hell" and "Mountain of Skullz" go for the dark side. "See You in Black," which has been performed by Blue Öyster Cult...is another good song. 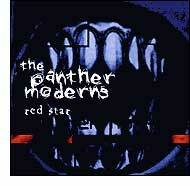 The Panther Moderns, in mood, style and content, seem much more in synch with the tenor of the times in which we live than a good 95 per cent of the bands out there. Red Star is a work that deserves to be heard. John Shirley's latest album with The Panther Moderns, Red Star, gallops with arsenical brio through vast landscapes of sound like a posse consisting of The Tubes and David Byrne, Devo and Ministry, Mink DeVille and Frank Zappa. Saddle up now! Eleven pieces of avantgarde rock, with the lyrics written and sung by John Shirley, with John Karr (who did the music) on guitar and keyboards, Mike Derry playing bass, and various people and some machines handling the percussion. The CD is unique, post-punk, neopsychedelic, semi-industrial, definitely listenable music with words veering into prose and the poetic.